That is the neatest idea!! Love it! Totally awesome, and I would have guessed much harder to make, just by looking at them! I thought there was going to be a lot involved with this project. I followed the link from the CRAFT page of FB and here I am and the project is so simple. I love it! Candy corn is my favorite! Love that idea! 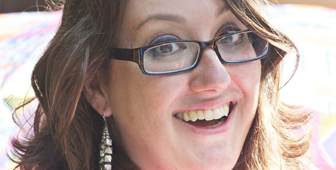 And I’m so glad I just discovered your blog…where have I been?? Visiting from Blue Cricket & now following! Oh, I really love this idea. They turned out pretty cool! That is such a fun idea. 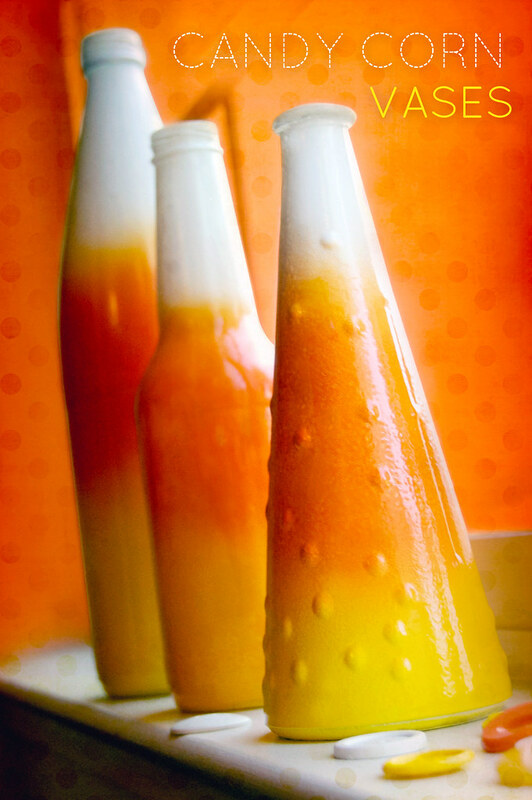 I’ve never seen candy corn bottles! I am featuring this at somedaycrafts.blogspot.com. Grab my “featured” button. I love this. I just saved the best bottle for it, unless hubby put it in the trash first. I justed posted this great craft as a pin on pinterest. Thank you for sharing this with, and I added your name and blogsite to my pin, to give you the credit you deserve. Thank you for sharing! I also pinned you on pinterest! I’m going out for some white, orange and yellow spray paint tomorrow! Those are so cute! 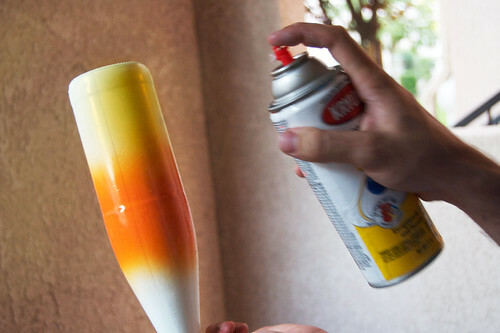 I already have the yellow and white spray paint so maybe I’ll try to re-create these someday. I love this! New follower! 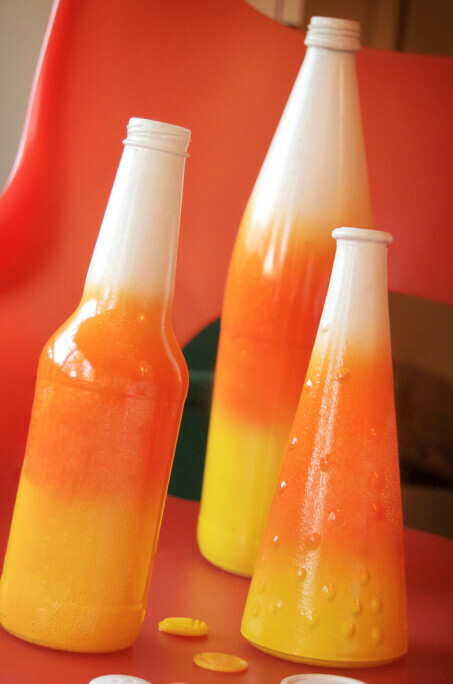 I love these bottles and love how they turned out. Thanks for all the details. Got her from Jen’s (TT&J) post on the FB Home Ec page. This was one of my favorites. You are a GENIUS! I love your blog so much – just found it today! I’m so excited! Oh I just LOVE this! Great idea! Does it have to be with spray paint? or could you use craft paint? Oh I used regular craft paint I could find good price on the colored spray paint I did use a glaze to seal But I post a picture of mine on my blog with a link to this site! These are AMAZING!! They turned out great! I’m hosting a Fabulous Fall party over at Not So Simple Housewife and I’d love for you to link this up! We are celebrating Fall and giving me and everybody else some great inspiration. We are looking for crafts, decor, food, and more! I’d love for you to add this and any other fall posts you may have! LOVE THIS! Im going to have to set some cool bottles aside for this project! Awesome vases. Here are a few more. I know this is an old post, but I wanted you to know this anyway. I just came across it yesterday. 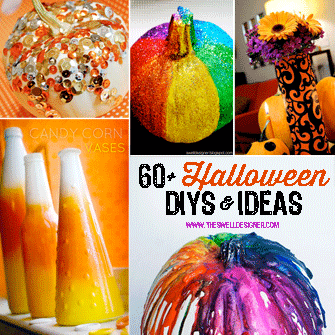 I am going to do this with ten 2L bottles and we’ll use them to bowl at a Halloween-themed, 3yo birthday party! Thanks for the great idea! These are super cute! I would love to invite you to share this, and any other posts, at my Creative Thursday Link Party at http://www.michellestastycreations.blogspot.com. Have a great weekend. 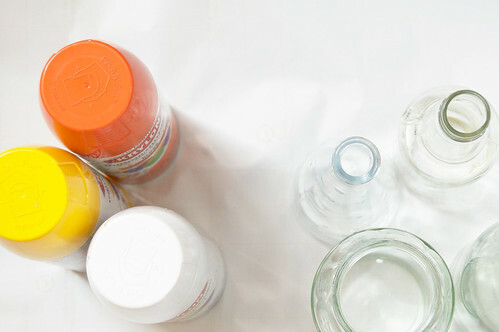 Did you have to prep the bottles in any way or does the paint stick without prep? Thanks! 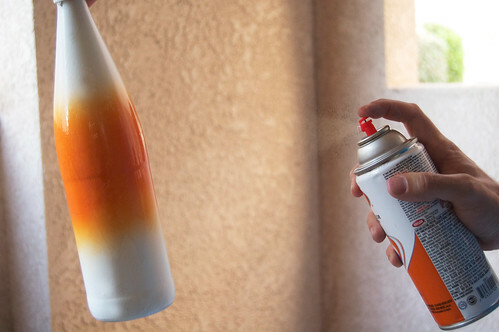 The paint sticks to bottles that are clean and without any residue. Use some goo gone if there’s labels/stickiness you need to get rid ot. So cute…I’m always up for spray painting something and with these results…what am I waiting for?